Recently I wrote this post Where to Find Work From Home Jobs. It included where to find work from home jobs such as freelance writing, virtual assistant, graphic designers, social media assistants, web designers, and more. All good jobs at a decent rate of pay. Today’s post is an extension of that. On Tackling Our Debt we often talk about ways to budget and save money. Ways to live a frugal lifestyle. But today we are going to talk about ways to make more money. In fact we are going to look at work from home jobs that will help you make more money, which is something many people love doing. 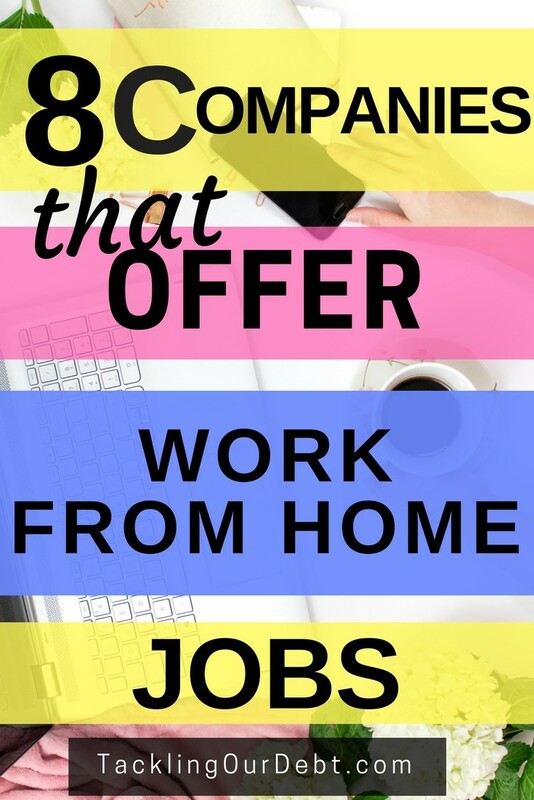 Finding decent work from home jobs has become quite easy so why not take advantage of it? After all you know that making more money allows you to get out of debt quicker, build up a retirement account, increase your savings, travel more, and relax, knowing that you have the money that you need readily available. Technology has changed so much over the past 18 years and more companies are realizing that they can take advantage of that and allow their employees to work from home. In fact there are many advantages in allowing their employees to work from home. From the company’s point of view it means that their expenses are quite a bit lower because they do not have to buy or lease office space or pay for utilities. As well they don’t have to buy office furniture, and in most cases they don’t even have to buy computers for their employees. As with most of these work from home jobs listed below, the employees supply their own computer, phone and Internet connection. And if you are reading this post, chances are good that you have what you need to do these jobs. A work from home job is a great option for stay at home parents, retirees, people with disabilities and people that are looking for extra income. The pay range varies for each job as well as whether you are expected to work full-time or part-time. You will need to check out the different companies below to see if they have what you are looking for. Large companies typically have some sort of call centre. Some are based within the company’s office building, but many call centres these days are virtual. Some examples of companies that use virtual call centres are airline reservations, hotel reservations, cruise line reservations, PizzaHut, Expedia, Rogers Wireless, roadside assistance, web hosting, Walgreens, 1-800 Flowers, and so on. Heck, I bet you did not know this, but even some of your favorite fast food restaurants are using call centres for their drive thru order takers. Working Solutions is looking for skilled, motivated people to assist customers with sales, service and technical support issues. While many inbound calls are handled over the phone, some are dealt with via email or online chat sessions. LiveOps is currently hiring work from home call centre agents for their Emergency Roadside Service division. The types of calls you will take will include Inbound/Outbound Sales, Customer Service, and Dispatch. Sykes Enterprises work from home call centre jobs are available for people in Canada and the United States. They work with a number of clients and their call centre agents deal with billing inquiries, customer care, warranty support, account closure requests, sales support, disputes, and so on. As an agent you will be trained to provide support from your home using online chat, email, telephone, and social media. Back in the day if you were having trouble getting good grades at school your teacher or your parents may have looked into finding someone to work with you as a tutor. It was only a matter of time before companies popped up online to virtually connect students from all over the world with tutors from all over the world. With Tutor.com you can work from home whenever you are available. Initially you will complete an online application and online exams based on your expertise. Once you successfully complete those you will do a mock session with an online tutor. If that goes well you will need to pass a background check and a final exam. Then you will become a tutor and you will be able to offer your services to students via tutor.com. As a tutor you will help students with their specific questions. Revolution Prep is seeking talented, high-achieving individuals to teach and tutor online. Before being hired each instructor goes through an intensive training program. Aim4A Tutoring is hiring tutors to provide online tutoring services to students worldwide. The subjects they offer tutoring in are Math, Science, English, Language Arts, and any other subject that is requested. They service the following grade levels: Elementary, Middle, High School, and College Level. HomeworkHelp.com is hiring work from home tutors to help students with live homework help and online tutoring. You will work with students in remote areas and connect with them in real-time using Internet voice chat, text chat, file share and interactive whiteboard. Brainfuse provides a variety of online learning services. Describing their services could easily turn into a whole new blog post, which isn’t going to happen today. But if you are looking for a work from home job as a tutor then you really need to check out their website to see what they do and how they work. Wow, this turned into a long post. As someone that has had her fill of the corporate world and driving downtown everyday to sit and work in a tiny cubicle, I think the above work from home jobs are an excellent alternative and a great way to make money. Many of them offer you the flexibility to work at your convenience. As well you save money on clothes, gas, transit passes, and food, because you do all of your work at home. NextIs It Possible to Reduce Your Monthly Grocery Bill with Coupons?